In 1992, a New York Times headline declared “The End of Books.” The future of literature, it said, was digital. Similar predictions were made for vinyl records, film, even paper. Yet the digital revolution has yet to strike a mortal blow against these older technologies. In fact, even as our computers have gotten faster, our devices smarter, and our lives more connected, a peculiar thing has happened –analog objects have made a comeback. Print books remain twice as popular as e-readers, vinyl record sales hit a near 30-year high, and online retailers are opening brick and mortar stores. An exploration of the re-emergence of analog in the digital age. David Sax Author of "Revenge of Analog: Real Things and Why They Matter"; contributor to Bloomberg Businessweek and the New Yorker's Currency blog. Virginia Heffernan Author of "Magic and Loss: The Internet As Art"
MS. DIANE REHMThanks for joining us. I'm Diane Rehm. A common belief about technology is that it always moves forward, leaving behind innovations of previous eras. The digital age was supposed to wipe out things like books, vinyl records, even the need for pen and paper. But recent years have seen a resurgence of many of the analog goods and ideas that had been written off as obsolete. David Sax writes about this phenomenon in a new book titled "The Revenge of Analog: Real Things and Why They Matter." MS. DIANE REHMHe joins us here in the studio. Also with us from a studio at Dartmouth College, Virginia Heffernan. She's author of "Magic and Loss: The Internet as Art." I'm sure many of you will want to weigh in. Give us a call at 800-433-8850. Send us an email to drshow@wamu.org. Follow us on Facebook or Twitter. And welcome to both of you. MS. VIRGINIA HEFFERNANIt's good to be here. REHMDavid, you called this book "The Revenge of Analog." First, I think you need to explain what you mean by analog. SAXThe very layman's definition and the broadest definition that I'm using is essentially what is not digital. If it doesn't need a computer to work, if it doesn't require a processor or the Internet, it's analog. And analog represents objects, things like turntables and vinyl records or printed matter, books, physical newspapers, magazines, FM radio. But it can also represent a way of thinking, a way of doing business so selling things in a store, brick and mortar retail, is -- I include the definition of analog. REHMAs well as, you know, practices such as teaching in a classroom instead of the notion that, you know, education can be replaced with online classes. So it's a broad layman's definition that I'm sure a lot of electrical engineers would have quibbles with. REHMAnd what got you started on this whole idea? SAXIt began about a decade ago and there were two things that happened in my life at the same time that got me thinking about it. One of which, at the time, around 2007, was that a lot of my friends were getting Smartphones for the first time. This was Blackberries, this was before the iPhone had even come out. And I noticed a very stark change in their behavior. I would be in the middle of a conversation with someone, even if they were driving a car, and they would just stop midsentence, look down at the phone and be gone for ten minutes or so. SAXAnd at the time, it struck me as this incredibly rude and interesting change and yet, within a year, I was doing the same thing and now, that's just commonplace. At the same time, my roommate and I, at the time, his parents had give us their old turntable and a bunch of their records. And this was right when we had actually just uploaded all our CDs onto iTunes and figured out how to stream them wirelessly through the house and yet, here we were, each night, sitting down, pulling out, you know, old Neil Diamond albums and Herb Albert albums and listening to them on this turntable and engaging with it. SAXAnd it really sparked this conversation about how the technology influences the way we perceive the world and the effect it has. And then, over the past decade, you know, that became something that, as you were saying in your introduction, became a more common cultural phenomenon. More people began buying vinyl records when, you know, soon after they had sort of deemed completely obsolete and they've been growing, you know, every year for the past decade in ways that were even bigger than the decades before. SAXWe're seeing sort of a resurgence of print books and independent bookstores are growing again. And so there's a broader cultural phenomenon that's happening here. REHMAnd you regard that as the revenge of analog. SAXRight. And I don't mean, you know, I don't mean that in a few years the Smartphone will go away and we'll all just go back to, you know, writing things on paper. SAXAnd, you know, your podcast will become an FM radio or an AM radio station again. But what I do mean is that, you know, these things that we had written off for dead that were supposed to be gone and in the dustbin and completely eradicated by digital technology are now growing once again and finding sort of a new life. REHMVirginia Heffernan, have you seen this same phenomenon? HEFFERNANI've absolutely seen it and it's been sort of extraordinary to watch. I think I sympathize with David when it comes to putting a name on what are those objects that resist digital? What are those objects that I believe defy digital? Revenge is a good word for it, because this is not -- there's nothing sort of accidental about this. There's something very almost florid and cartoonish about the things that have returned. For instance, in, you know, what's meant to be hipster Brooklyn, in Bushwick, you have people not just going to vinyl, but going to butchering their own meat, you know. HEFFERNANThis is a time when you want not just a return to 20th century culture, like records, but a return to 19th century culture, a return to agrarian culture. And that, I think, is in forceful defiance of some of the limitations, but also kind of grand cultural themes of the Internet. I sympathize, though, with David in trying to decide what to call these things. His book is called "The Revenge of the Analog: Real Things and Why They Matter." HEFFERNANAnalog is a strange word. Real is a strange word and things is a strange word. And you know, the fact that analog described a progressive new technology not just reality, but once described, you know, it's not -- you don't have to be an engineer to say there were mechanisms that were analog. There were compasses, there were sextants, there were, you know, as they say about ideology, people who resist ideology are sometimes under the spell of a new ideology. HEFFERNANPeople who resist digital technology are sometimes under a spell of an older technology. You know, the miss the printing press or they miss vinyl, which were very advanced technologies in their day. So this is not just pure Luddism. This is not just a preference for the real over the virtual. This is a love of certain 20th century and 19th century technologies. REHMOn the other hand, here's a website comment, David, which says, "moving to digital photography has a big advantage. Does anyone actually have to pay to have their photographs printed anymore? Same with music. I still have all of my vinyl records, but I also copy them to my iPod. The music on my iPod would fill a 12X12 room if it were vinyl." So there's that side of it. SAXWell, that sounds like a fantastic record collection. REHMYeah, you bet. You bet. SAXI think, you know, what that commenters getting at is the reality of what Virginia and I have observed and that's the people who are electing to take up analog technologies again -- and often these are much younger consumers, right? SAXWell, they're doing it for two reasons. One is pleasure, right? For the person who goes out, like myself, and buys vinyl records, I know that it costs more money, it takes more time and effort. It takes up valuable space. SAXIn my house that I have to negotiate with my wife for a brand new shelf because I've run out of shelf space for my record collection. But it brings me joy. And it brings me a joy that goes beyond the sonic quality of the music. It is the joy of the tactile experience, the joy of going into a record store, when I visit a city, and spending an hour in there, learning about new bands in a way that, yes, I could find that same information in music on my Spotify account or by Googling. SAXBut it's not as much fun. I can't invite Virginia over to my house and she can't peruse through my iTunes or peruse through my Spotify playlist with a glass of wine in the same way that she can if she comes in and looks at my bookshelf and looks at my records. REHMAnd Virginia, you talked about cutting your own meat and going back to the 19th century. Why do you think this is happening? HEFFERNANWell, I mean, one of the things -- I was one of the -- well, they called them, and I think I can this on the radio, glass holes, people who used Google Glass, the short-lived experiment that Google had of wearing the Internet, basically, on your head. And I walked around Brooklyn and I had people say, you are this bad thing, this jerky thing, this show-off to my face and they said, who needs Google Glass when you have handmade ukuleles? Ukuleles, I mean, come on. HEFFERNANSo, you know, I think one of the things, you know, that we're sort of not saying when we talk about floor space or shelf space is that analog culture, you know, non digital artifacts, totems of the 19th and 20th century are expensive. And they are -- it's prestigious to own them. You know, the idealized reader of, you know, of great books has a giant library with Moroccan bound volumes in it. And always, there's wine in this story and you imagine a beautiful wine cellar or you have the space for vinyl. HEFFERNANThere's a reason that in small apartments, people, really early, embraced technology and drove the price cheaper in New York, including synthesizers and sound machines that were, you know, it very soon derided as against the, like, beautiful guitars and drum kits that white kids had and middle kids had in their garages, and then also headphones because you have to shut out the noise. REHMShutting out the noise. Virginia Heffernan, she's the author of "Magic and Loss: The Internet as Art." David Sax is here in the studio. His new book, "The Revenge of Analog." We'll take a short break. Your calls when we come back. REHMAnd welcome back. Here in the studio, David Sax. He's author of the "Revenge of Analog: Real Things and Why They Matter." He's a contributor to Bloomberg Businessweek and New Yorker's Currency blog. Joining us by ISDN and Skype from Dartmouth College, Virginia Heffernan. She's author of "Magic and Loss: the Internet As Art." REHMAnd before we go on, I want to read you this email from Jenny. She says, here's why the word revenge fits. I don't feel I have had a choice in the way tech is taking over. As a parent, as a human, the seemingly inexorable march toward virtual reality has felt like a crime. It sounds extreme, but I feel something has been stolen from me and especially my children, digital natives, against my will. So the word revenge makes me happy. REHMAnd this book, this author, and this show is the best news I've heard in a while. I don't feel so alone. There you go, David. HEFFERNANThat is a publishable paragraph. I love that paragraph. SAXThat'll go on the paperback. REHM...how widespread do you feel that loss is? HEFFERNANI mean, as we just had in this brilliant message, we just heard a taste of the kind of grief that has attended the digital revolution. And we've spent the last almost 20 years trying to articulate that grief. What is lost from Kindle books that you find in the moldy bindings of a book from the local library? What is it? Is it -- do we really just miss something in the mold? Is there something intrinsically preferable to vinyl, with that sort of dusty, hairy sound of the needle hitting the record? You know, that it's not the march of progress to listen to that muddier base signal on vinyl. And yet we have a longing for it. HEFFERNANAnd techno-utopians will tell you, that's nostalgia. They talk like, you know, Bolsheviks, when they say, you know, digital is rolling along. And forget your olds stuff. Burn your books. You know, like that '92 Times article, this is the end of books. Give it up. The new regime is here. And that is maddening. And as your writer just said, lots of people feel like they don't have a choice and that they didn't grow up with it. They're -- they have beautiful skills like handwriting or very concerted, long attention spans for books. And these things have been devalued. Not only devalued, their inadmissible in digital culture. And who wouldn't feel left out? Who wouldn't feel left out and who wouldn't feel a streak of actual, palpable pain? SAX...and turntables and records. And to them, it's not, oh, remember the past, as the Bushwick waxed mustached butchers are doing. SAXTo them it is an entirely new thing. And they -- and they're gravitated toward it because it's different than the ubiquitousness of digital. SAXEverybody has an iPhone. It's -- there's nothing new to it. SAXThere's nothing unique about that. REHM...it's not just here in the U.S., but perhaps it's the beginning of a worldwide phenomenon. REHMHere's an email from Travis, who says, with digital, we can have more -- more music, more news, etcetera. REHMIs more better? I think not, he says. Are we failing to curate the best, when everything is available. And that takes me back to this whole issue of fake news and how that is proliferating online without our control. SAXAnd I think it comes down to a qualitative argument, right? In the world of digital, the great advantage of digital is that you can disseminate, you can copy, you can democratize things. Information, you know, the ones and zeros that are produced by The Washington Post and The New York Times are on your flat screen, on the dashboard of Facebook, no different than that of Infowars or whatever, you know, Vladimir Putin's latest website is. SAXAnd so that the idealism that came in the early days of the internet, the utopian ideal that Virginia spoke about before that, oh, well, this -- the internet is going to open it up and everybody will have a word and we'll break down the barriers and, you know, it'll be a brave new world, really, over the past couple weeks has come back to bite us now. And we're -- I think we're realizing the real-world consequences of that. The shooting up the street here, next to the great bookstore Politics & Prose, where I had my event just a few weeks before, is just but one example of that. REHMBut now what about, contrarily speaking, Cyber Monday? And you had all these people buying online and breaking records there. So clearly, while they may be choosing to go into brick-and-mortar stores and many more are being built, you've still got people going online to buy. Virginia. HEFFERNANWell, it -- this is just such an extraordinarily rich topic. I mean, and naturally a conversation these days, not even -- what are we, we're almost -- we're a month out from the election -- might start in vinyl, but it's got to end up with Donald Trump, let's face it. So, you know, one of the things that is -- has been interesting about the fake news phenomenon is -- and I'm going to get a little schematic here -- but I see, you know, it's sort of a commonplace in macro history to describe civilization as a charge in increasing abstraction. So you go from animal sacrifice to prayer, or gold ingots to finance to pulses on credit cards to Bitcoin. And Trump ran on this idea of the return, in some ways, to the real. He's a builder. HEFFERNANBut what's interesting is he's also a brander. And a lot of the rhetoric around his campaign was about return to the earth. Return to the made thing. Return to industrialization. Then, at the same time -- and he was campaigning against finance and against abstraction and against this very rarified vocabulary of the elite. At the same time, he was very cannily using Twitter and in some cases what's now called disparagingly fake news. But let's remember, the fake news readers consider that alt-news. They consider that the news that cuts against the dominant narrative. HEFFERNANJust as the left once thought that they were the antidote to doublespeak. Remember the doublespeak of the Vietnam Era, that very concrete language about our bodies and how we -- and free speech was being gagged. And all of a sudden, the real story of Vietnam came out over and against this fakey establishment language. So that is a phenomenon of the internet absolutely. The first sites I wrote for online -- and I always only, I always wrote online first -- were for places that told indie-stories, little memoirs, little alternative stories that you weren't getting from the print paper or the networks and even NPR. HEFFERNANAnd so, you know, I do think it's an epiphenomenon of the internet that we get something like fake news. At the same time, Joi Ito at the Media Lab says, digital might represent progress, you know, or it might represent the next thing, but it's not necessarily a good thing. You know? It could put someone like Donald Trump in power. So, you know, I find that extraordinarily interesting. It's hard to talk about digital without making it sound like it's all good. And it's not all good. SAXAnd I think that's -- that is one of the bigger forces behind this phenomenon. You know, the narrative of the past decade -- let's say the, you know, the iPhone era -- has been very much one that Silicon Valley sort of set the narrative that we're in this wonderful new world and here's all these wonderful things that are going to happen. And, you know, that was everything from the business model, you know, everybody should be their own venture capitalist, angel investor and invest in start-ups -- and I have done this myself -- you know, to the notions of education and art and culture that, you know, if you do something digitally, that is the way forward and that's the thing. SAXAnd I think now, having lived with smartphones for a decade, we're coming to a point of maturity where we're seeing where this benefits us -- as societies, as individuals, as institutions -- and where it does have problems. Where analog might provide a better solution or at least a different solution to a certain problem, with a different result that might be more appropriate for whatever it is that we're doing. SAXWell, one example, let's go back to retail. You know, you talked about Cyber Monday and the growth in sales. And yet, at the same time, you have companies like Warby Parker and Bonobos and Amazon, you know, ecommerce retailers, which were created to disrupt the brick-and-mortar retail store by selling products online. They're all now opening stores. SAXAmazon's opened, I think, three bookstores in the past year. They're going to open a lot more. They've just launched this new service, Amazon Go, which is going to be sort of a supermarket where you can shoplift the goods out of I guess and they'll charge you as you go out the door, and maybe some sort of explosive-equipped drone will prevent you from stealing a cantaloupe or something. SAXBut they're not doing this out of nostalgia. They're not doing this to simply advertise in the real world. They're doing this because the economic model of ecommerce-only retail is very difficult to make a profit from. REHMAnd you're listening to "The Diane Rehm Show." I'm going to open the phones. We've got some really interesting callers waiting. First to Zachary in Cincinnati, Ohio, you're on the air. ZACHARYHello, everyone. I was just wondering if maybe this resurgence in analog is also due to control. We know for a fact that NSA is spying on citizens and we know about digital rights management. And people kind of reject being controlled. I know I do. I've always had vinyls. But my vinyl collection has grown. And I like to be able to share that with somebody, which you can't do with an iTunes phone. HEFFERNANI, you know, we've talked about nostalgia and pleasure and even this sort of perversity of the Bushwick crowd butchering their own meat and turning to flip-phones or less technology. And we've talked about the commercial possibilities of objects in three dimensions. But the thing you bring up, the security factor, is really interesting to me and it really does buy us the culture in favor of. so, for instance, Goldman Sachs, you know, caught with emails talking about pumping bad mortgages, turned to this little code, like, almost a hashtag, LDL, let's discuss live. Let's drop off email, where the things can be searched, subpoenaed, solicited, and turn to live meetings. HEFFERNANAnd when you have live meetings, as a way of defying the SEC or whatever reason, the NSA, you end up with more meeting spaces, more movement of bodies by transportation, less telecommuting, and it has big effects. The other thing I love on the security tip is -- or interests me, is that the Navy, for fear that GPS technology will be hacked, has started to train sailors on compasses, sextants and even celestial navigation -- navigation by the stars. HEFFERNANSo these analog returns are not just, oh, vinyl sounds warmer, better. I remember it from childhood. These are actual security measures. They're actual measures with commercial and military applications, which really does bias the culture in favor of -- bias, you know, biased technology in favor of a return to analog. There are a lot of advantages. SAX...in the system that can prevent a sort of catastrophe. REHMHere's a contrarian view from Taylor, who says, I understand the resistance to globalization and its digital trappings. But isn't this analog fetish ecologically irresponsible? HEFFERNANI think this is a fascinating point. David, I mean, you've really reported on this. And I should say, "Revenge of the Analog" is a brilliantly reported book. This is not just armchair speculation. He -- David has gone and talked to so many people about this. Say something about the environment, David. SAXNow say something. Thank you. Thank you so much. I have now answered for the sins of all of this. Look, it is, you know, film photography production is one of the most industrially, chemically complex and highly polluting industries. And so when you compare that to, say, Instagram, of course, the ecological footprint is larger. You know, vinyl record production relies on melting whole bits of petroleum into pieces of music. And then, you know, the world of paper and what it does. It is not without cost. REHMAnd we'll get back to more of the costs after we take a short break, your calls, your comments. Stay with us. REHMAnd welcome back. We're talking to two fascinating people about what's happening in this world of analog and digital. David Sax is the author of "The Revenge of Analog: Real Things and Why They Matter." Virginia Heffernan, she's on Skype and ISDN from Dartmouth College. She's the author of a book titled "Magic and Loss: The Internet As Art." REHMNow I have to read this email from Don, who says, surely the guests are not suggesting that people are replacing digital with analog. I think either/or is a false dichotomy. 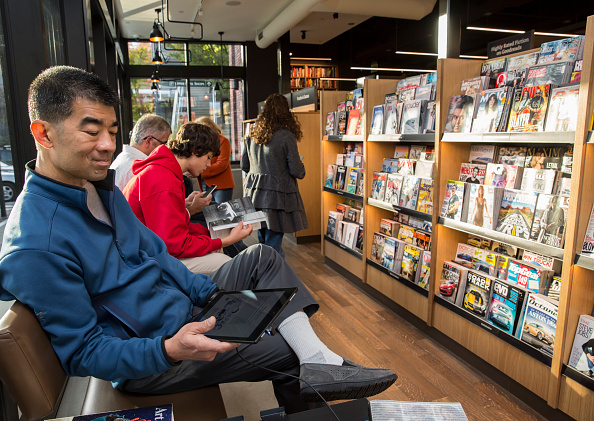 People use both digital and analog depending on their immediate goals and context, a paper book to read in the bathtub, an ebook or Smartphone to read in the supermarket checkout line. SAXThat's a very, very long supermarket checkout line. I agree 100 percent. You know, it -- the either/or is the false dichotomy almost presented to us by the language of digital, binary right. It's either a one or a zero, black or white, Apple or Samsung. And the reality is even the, you know, prototypical Brooklyn hipster who we mentioned in the beginning and of course we're just going to keep bringing up because it's always so much fun. HEFFERNANBecause why not laugh at him, his moustache. SAXThey are taking Instagram photos of their -- of their pork butchery class while they go home and will listen to Spotify on the walk home before they go place their album on their turntable. HEFFERNANBut, you know, we're wrong to see that. I mean, I don't know if you agree, but as, like -- well let's not say deplorable, despicable hypocrisy because I think in -- David, correct me if I'm wrong, but oh yeah, you have this Marshall McLuhan at the beginning of your book, a new medium is never an addition to an old one, nor does it leave the old one in peace. It never ceases to oppress the older media until it, and I think that's the older media, finds new shapes and positions for them, or the new media casts old media in new places. HEFFERNANYou know, I'm -- I think maybe too positively about this, but I think that dynamic tension between the real and the virtual, between the analog and the digital, is extraordinarily good for the culture. You know, and, you know, you take something like Amazon, you brought up Amazon, we think of Amazon as digitization that puts -- that puts, you know, bricks-and-mortar stores out of business. Well Amazon is responsible, more than anything on Earth, for the circulation of what George Carlin used to call stuff, right, stuff that you hold in your dusty little hand. HEFFERNANYou pay for Amazon Prime to get quick delivery of your mugs and your umbrellas and your flashlights, and then you get free video because nobody will pay for intellectual content anymore, nobody wants, you know, really wants to pay for the, you know, the print New York Times, which is very expensive to make or maybe more people now but not in the past, and yet they will pay $20 for a mug, which costs a vanishingly small amount of money to make now. HEFFERNANSo, you know, there is the pushback of stuff is in heavy circulation right now. I mean, I mean tchotchkes, I mean silly stuff. I've been reading the gift lists for Christmas, and they are just ludicrous suggestions of, like, the next scented candle you need. And then at the same time, we're supposed to be in this, like, all-digital world, and yet all we want to get our little paws on are, you know, little GI Joes or whatever. SAXI think I know what's on your Christmas list, the $20 GI Joe mug. HEFFERNANPlease, I wanted to get that in on live radio in case Santa is out there. SAXI think, you know, that's the interesting thing, that you talked about sort of the idealized virtual apartment of the digital age, right, someone who gets that, you know, 300-square-foot beautiful condominium with the crisp white walls and, you know, that you walk in, and they have a big-screen TV and an Apple TV and a Sono speaker, and they don't need anything, and it's the most depressing place in the world. SAXAnd then contrast that to my friend's house in, I hate to say it, but Brooklyn, where I had Thanksgiving a couple weeks ago with a fireplace and bookshelves and, you know, there were -- you know, the steak knives had antlers on them. I mean, it was -- you know, it was like a horrid issue of Kinfolk gone to seed. And yet, you know, that defines them, right. There's that warmth in that stuff, and I think this kind of idealized post-capitalist, digital utopia that we imagined in the past couple years may not necessarily be what we want, that once we're presented with that, we're like, okay, now what am I going to give Virginia for Christmas, I can't just give her another iTunes gift card. HEFFERNANYes, digital gift card, come on. REHMI'm going to open the phones now first to Meredith in San Antonio, Texas, you're on the air. MEREDITHHi, thank you for having me. MEREDITHI wanted to say that so much of this discussion and some of the other listener callers have sort of stolen my thunder. But I wanted to ask for you to discuss a little bit maybe some of the opposite of one of the last emails that said that maybe some of this return to analog is actually not eco-friendly. One of the thoughts, I'm loving this discussion, but one of the thoughts that I'm having as I'm listening to you guys is I used to live in Bushwick, and I actually lived there before it was cool and trendy, and I'm too old and I'm too old and fat to be a hipster now. MEREDITHI'm not that young anymore, and I'm not that cool anymore, but we do things like butcher our own meats or buy really high-quality kitchen utensils that I hope I'll be able to pass on to my daughter, and I don't do it for the same reason that other people wear skinny jeans. I do it because I want to make a positive footprint and impact on the environment. MEREDITHWe butcher our own meat or work with local farmers to do it because we think it's important to have high-quality food. And so I wanted to talk about that aspect. We're not all out to stick it to digital, and we're not all in revenge mode. Some of us are really just interested in returning to a time, maybe, where the quality of our lives was as good or better as it was with all this technology. HEFFERNANThis is really a good point, and we got to lay off those hipster jokes because that is a tiny fragment of the population. SAXNever say that. Never say that, Virginia. REHMSewing their own clothes, doing their own cooking instead of buying it from the already-made supermarket counter. SAXOr the Blue Apron delivery service. HEFFERNANThe Blue Apron delivery service, which, like, right, exactly. And I think this is important to bring up, that there are -- you know, we could go back and forth, and I think probably David has the numbers on this better than I do, but on whether the, you know, more expensive life is the digital or the analog one and the most, you know, sort of thoughtful and considered. HEFFERNANI do think it's important to keep in mind that people in small apartments, and I live in a small apartment in New York, you know, for instance my parents don't like that my kids are on their tablets, but I would rather, not having the floor space -- this sounds silly, but I think this plays out, this works writ large, too, I would rather have them play the game of Life with a spinner and little pieces and whatever all in digital artifacts than spread that all out over the floor. HEFFERNANAnd frankly I don't have the space for tons of shelves of analog -- of vinyl records or books, nor do I have -- I certainly don't have room for, like, a little group of chamber musicians coming in or, you know, lots of live music. So, you know, I do think that there's some memories from the '70s. HEFFERNANOf when synthesizer culture belonged to poor people who couldn't afford drums, and, you know, and the music was condemned as being heartless and tinny, and you see this sometimes in the condemnation of music from Asia as being so technical and, you know, and I think that there's, you know, honestly a bit of xenophobia and elitism in that. But then by contrast, you know, nothing saves money like sewing your own clothes and growing your own foods. HEFFERNANSo I think it cuts both ways. SAXYeah, and I think, you know, when it comes to the food thing or the clothes thing, I mean then we're not talking about analog or digital. It is a much sort of larger cultural movement. And the thing that links them is that -- is the quality of the experience, right. There's -- before I came on the show I went to this lovely bakery across the street. What's it called, Bread -- Bread something. SAXWhat is called an artisan bakery, you know, very high-priced. REHMAnd that's Mark Furstenberg who owns that. SAXLoaves and incredible babkas, just absolutely delicious. And, you know, it reminds me of some of the writing of Michael Pollan in "The Omnivore's Dilemma," the idea that yes, the most -- you know, it is more economical and efficient to buy a loaf of Wonder bread than to buy the, you know, $6 sourdough at Whole Foods or a farmer's market. Of course it is, but you're getting something totally different. SAXAnd so, you know, it is up to people to make those individual choices, and sometimes it does cost more money, and sometime people think it's worth it to pay that extra bit. REHMHere's an interesting point. Could the race toward digital actually lead us backwards to becoming illiterate as people lose writing skills, David? SAXYou know what? I'm going to defer to Virginia because in her wonderful book, she talks a lot about, you know, reading and writing. SAXWell and also that there's a different kind of reading and writing that happens digitally, but I'll let her answer. HEFFERNANYou know, I think that just as, you know, contempt for one technology is often allegiance to another technology that, you know, that resistance to -- or a love for a bygone prose style, you know, or let's say writing itself is lost. Well, what do you make of Twitter? Twitter would be the perfect, that's not writing, it's subliterate, you know, it's beneath contempt. Reading text messages with their silly abbreviations is -- you know, nothing could be worse, nobody's reading Immanuel Kant in the original German with a German-English dictionary and so on. HEFFERNANBut, you know, tweets, for example, are -- Confucianisms, say, are -- would take much, much fewer than 140 Chinese characters. And there is a great tradition of writing in epigrams, writing lyric poetry. Just because it's short doesn't mean it's profound, a beautiful, elegant tweet, and you can just look at some writers, often they pin their best tweets, so the best tweets come up at the top, you know, can be this excellently apposite, beautifully phrased tweet. It is writing. REHMAnd think about the haiku as an example. REHMOf absolutely gorgeous writing. And you're listening to the Diane Rehm Show. David, we should not forget to mention that when television came along, everybody said was radio was going to take the big hit, and look at where radio has gone. SAXAnd when film came along, everyone said the theater would be dead, right. Try getting a ticket to "Hamilton." Or I was at a wonderful play the other night in Toronto called "Come from Away," which is heading to Broadway soon, completely sold out. The second that the first note hit, I was basically, you know, choking back tears the entire time because -- and I think this is the key thing here is that, you know, once you're presented with that new technology, there's this -- that initial period of magic that Virginia is talking about. SAXAnd the older technology seems, well, old, and sort of it loses its value. And then I think what happens is after a period of time you realize where -- what was sort of being lost, right, what -- what is beneficial about that, which is why, you know, Broadway sales are growing. And again, you know, even though podcasts are doing really well, and I wish you a lot of luck in your new podcast. SAXYou know, listenership for public radio is still strong. SAXYou know, and it has an even more important voice. REHMAll right, let's go to Eli in Baltimore, Maryland. Hi there. ELIHi, thanks for having me on. ELISo I had a question actually going back to sort of the beginning of the discussion regarding analog versus digital, and it's -- the question is referring to a 1950s paper that Alan Turing wrote called "Computer Machinery and Intelligence." My question is how do you think Alan Turing, his philosophical and mathematical materialism should be interpreted in the dichotomy between that of the digital and the analog? REHMWhat do you think, Virginia? HEFFERNANI -- you know, I have to admit something. I'm so immature that I was tweeting at David just now while we were talking. HEFFERNANAnd I'm immature enough to think that's fun. And look at David, I can see him on Skype, he's not looking at Twitter at all. HEFFERNANDavid is fully analog, and I'm back in 2010 tweeting. I should defer to David on the question. I didn't hear it well. SAXI was deferring to you because you're the cultural studies and philosophies Ph.D. I just did a bachelor of arts in something that I can barely remember. But I think, you know, the dichotomy, as McLuhan said it, as, you know, one of the interesting things that -- I'll answer you, Eli, in a very abstract way that probably isn't what you wanted. SAXBut, you know, when I started researching this book, of course I expected to hear sort of the log of analog and where it was growing from those in those industries, right, the people who are making vinyl records, bookstore owners, publishing people, and I did. The strongest response and sometimes the one that was the most surprising came from people who worked in the digital technology world, engineers, coders, people who had start-ups, venture capitalists. SAXI spent quite a bit of time out in Silicon Valley, in San Francisco, talking to people at Google and Facebook and Yelp and Twitter who not only believed in their personal lives that, you know, analog had a benefit, and they went home to, you know, the very record collections that we're talking about and printing presses, but actually in those companies they're integrating a lot of those analog processes into what they do in order to build better digital products. SAXThis is everything from sort of unplugged meditation sessions at Adobe to designers at Google using pen and paper as the first draft of everything they do. REHMWell, it has been a fascinating discussion. I want to thank you both so much. David Sax' new book is called "The Revenge of Analog: Real Things and Why They Matter." Virginia Heffernan is the author of "Magic and Loss: The Internet As Art." Congrats to both of you.